Will you show up and walk? Sometimes I get calls from people who are hoping for a little magic to help them help someone else. The evidence on magic isn't very conclusive. While there are widespread stories of its effectiveness, most of the evidence comes down on the side of small, repeated changes in state and perception that gradually lead to a new way of thinking and feeling. "Can't you speed it up through trance? I saw someone cure a phobia on youtube and it only took a minute or two." And behind the protests, I think I hear the voice of doubt whispering "maybe you're not as good as the magic ones." What metaphors can teach you about your desired future. I've been at the beach. As you can see, it's not a metaphorical beach. 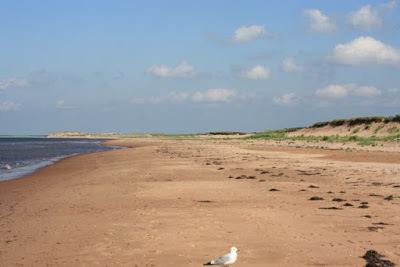 This picture was taken in the national park on the north shore of Prince Edward Island. The bird in the foreground is a real seagull. This beach is a metaphor. It tells me exactly what I want in my experience as I encounter the clouds and the sunshine, the wind and the sand and the waves of life. It speaks to a paradoxical balance of elements, a balance of focus and soft edges, a balance of ground and flight. If you asked me to describe what I want REALLY, I would stumble and hesitate. I would contradict myself and backtrack. I would have commitment issues. If you asked me to tell you about this beach, you would know exactly what I choose as my experience and who I am choosing to be as I move forward. This is my desired future. But my desired future is not to stay on vacation - it's to bring this paradox into the clutter and contradiction and productivity that is my work and my life and my joy.